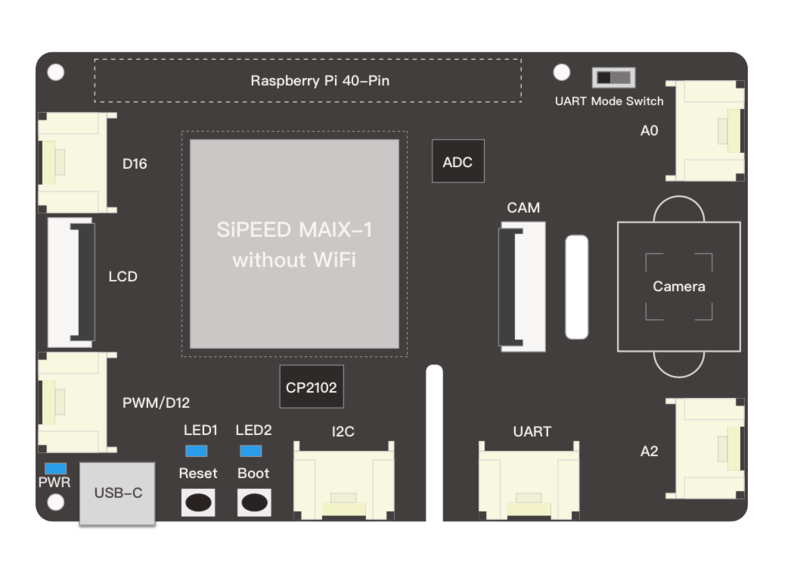 The Sipeed MAIX-I module is the first RISC-V 64 AI module based on the powerful KPU K210. 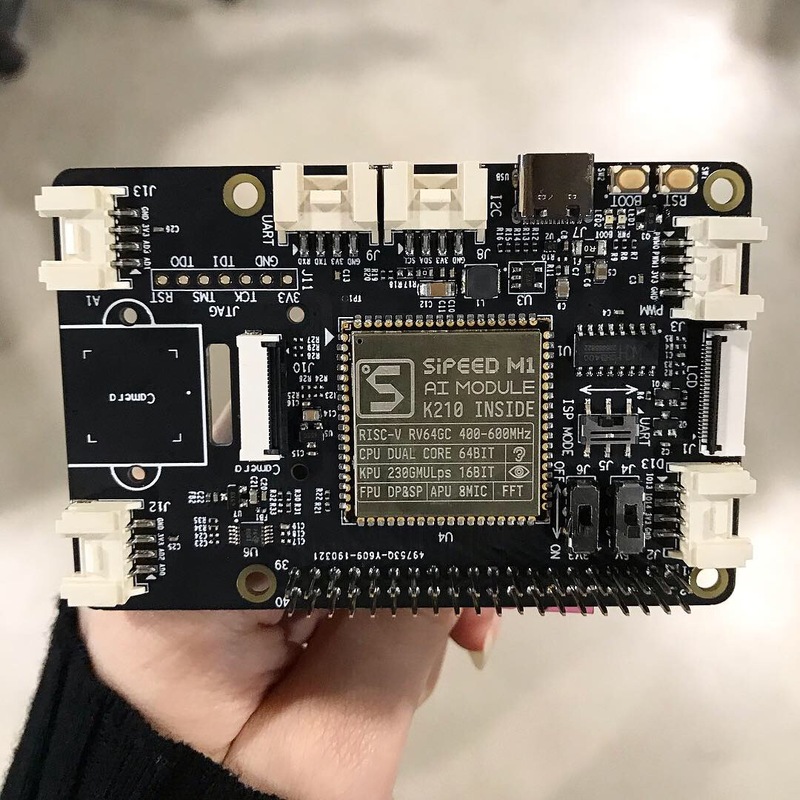 As a close partner of Sipeed, we are very excited to announce that we are going to make a Grove HAT for Raspberry Pi based on the Sipeed MAIX-I module, aiming at enabling more possibilities of AI model in areas such as predictive maintenance, anomaly detection, robotics and many more. Grove is a modular plug-and-play ecosystem that includes more than 200 different kinds of sensor, actuators, displays etc. So, don’t hesitate to share your thoughts and ideas with us in this forum! Check out the first look we have so far and let us know what features you would like to see and have the chance of making it to the final product. If your idea makes it to mass production, of course we will send you a free sample!!! These products are designed for you and the rest of the community, so it only makes sense for us to listen to what you want for your next AI project. UPDATE: We are going to release Grove HAT for Edge Computing next week for pre-order! 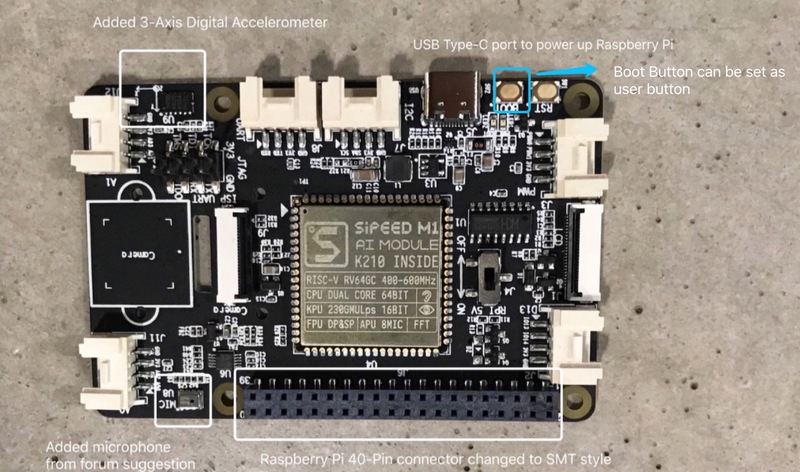 Finally we take suggestions in this forum by adding 3-Axis Digital Accelerometer, microphone and changing Raspberry Pi 40-Pin connector to SMT style. 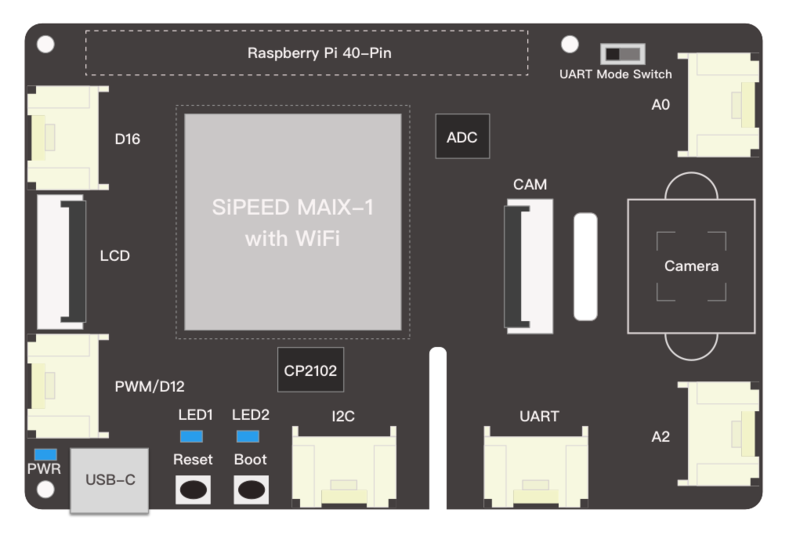 The USB Type-C port can directly power up Raspberry Pi. Boot Button can be set as user button. Last edited by elaine.wu on Wed Apr 24, 2019 7:01 pm, edited 5 times in total. I would love to see a SATA interface for either an SSD or a conventional hard drive. I reckon that this would make a pretty awesome platform for introducing students to RISC-V, JTAG, and debugging. 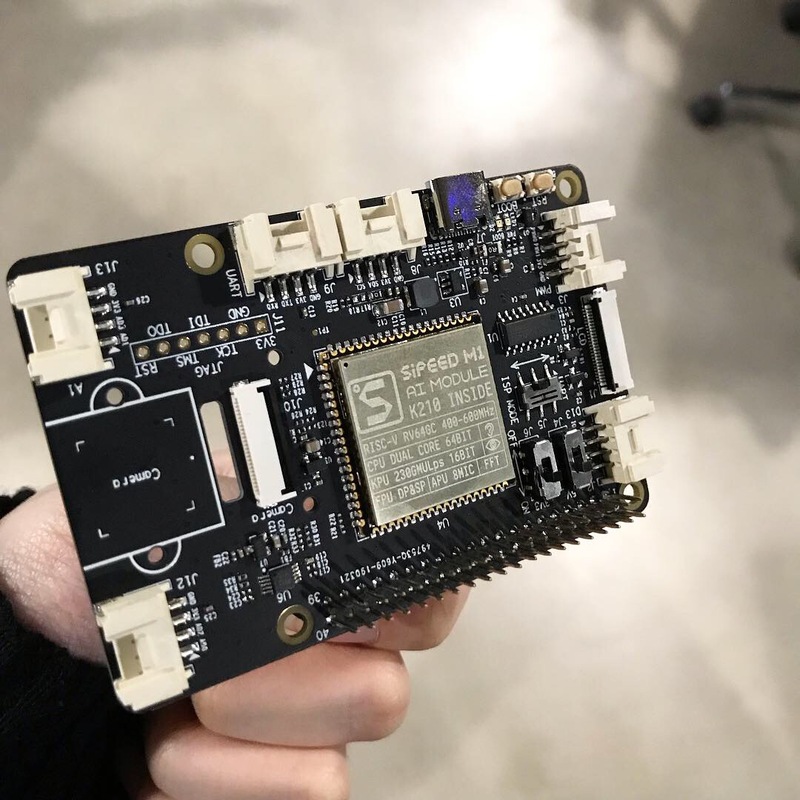 SPI comms with the Raspberry Pi - please layout the Grove AI HAT PCB so that a Raspberry Pi SPI master on the HAT connector (Raspberry Pi is only an SPI master) can talk to an SPI slave on the SiPEED MAIX-1 (SPI much faster than UART...). However, unlike the K210, the Raspberry Pi doesn't have a full FPIOA, so you will have to accommodate its limited choice of HAT pin functions when you layout the Grove AI HAT PCB - only some HAT pins can be used for SPI etc. SATA interface is interesting.......however for the basic and medium projects, SD card would be enough with smaller space requirement. If there is needed for SSD, an USB to SATA adapter would be more convenient. A microphone could be useful. Make it a real edge device by including LoRaWAN. Awesome stuff! I suggest to put at least a couple more Grove connector sockets on the board, there seems to be enough room left. This would allow to connect several additional Grove sensors (there are many for about anything), which could be used as additional input to ML models and allow to do sensor fusion projects (because using AI for camera only is somewhat limiting). Grove actuators can be hooked up as well to sockets (relays, motor controller, etc.. there are a lot of Grove accessories) and can for example be controlled from the output of a ML model; this is easy to do. I suggest to put the additional Grove sockets vertically, just like on the Seeeduino Lotus board instead of lining them up at the edge of the PCB. You could probably have 4 analog and 4 digital ports, instead of 2.